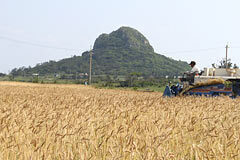 On March 30, the wheat harvest goes ahead in the fields at Higashieue, at the back of Gusukuyama Hill on Ie Island. Now is the wheat harvest season on Ie Island, the only place where wheat is grown in Okinawa. The season started from the end of March, and goes through until the beginning of May. Waves of golden wheat sway in the wind under the spring sun in the fields of Higashieue on the other side of Gusukuyama Hill. The staff of the Ie branch of the Japan Agricultural Cooperatives Okinawa are now busy harvesting the wheat.